I recently had an extended layover in Abu Dhabi and went out to explore the city's must-see new architecture. I recently had an extended layover in Abu Dhabi and went out to explore the city's must-see new buildings. Regarding contemporary architecture, Abu Dhabi shines less bright than its bigger sister Dubai, having less iconic pieces and areas. This scenario is slowly changing, however: the city is in frantic construction, with several high-profile projects to be finished in the next years. To explore Abu Dhabi. I decided again to take the Big Bus Tour , which proved quite a pleasant surprise during my visit to Dubai last year. But that turned out to be not so interesting in Abu Dhabi. My first stop was to be Masdar City, which opens from 8:30 am. The first buses start to operate quite late at 10 am, so instead of sitting at the hotel waiting for the first bus which would take me to my first stop, I just hopped in a taxi, and 15 minutes later I was there. Check also the Architectural Map of Abu Dhabi on Google Maps. This is a building I quickly dismissed as a show-off architecture when I saw it from the taxi window. Like many things in the UAE, it is a tower of superlatives. It holds a Guinness World Record for “world’s furthest leaning man-made tower.” All floor slabs are different, and no room is the same. Also, each triangular facade panel is different, and no structural member is repeated. These are features that, for me, makes it a project that shows what not to do when designing a building. However, it also makes it into a must-see project, if not for all of its merits, at least for the fact that such a building stands. I regret not stopping there to check it out. It stands impressively in the skyline of the city, with its crazy 18 degrees lean. Close-up, however, it looks a bit messy. The sun canopy on the east side is relatively ugly, a departure from the clean lines in the original design, and the straightening of the curve towards the base shows the limitations of such audacious design when it becomes a reality. Also, the facade looks a bit heavy with too many lines and elements screaming for attention. Nevertheless, I put it on my list of places to revisit in my next trip to Abu Dhabi. Although not my favorite looking building, it is indeed an impressive feat, and I wonder how the spaces and direct surroundings feel, especially the large atrium of the Hyatt hotel starting midway and funneling up and out all the way to the top. I lost count on how many times we had a picture of the iconic Masdar City master plan from Foster+Partners on our project wall at the office as a reference for something. In its original design, it is impressive. I will never forget the first time I saw that aerial render, the perfect square in the middle of the desert, the incredible buildings, the central plaza and the small alleys. In reality, only a tiny percentage of that is now standing (around 300,000sqm of the first 1mi sqm planned). Blame the global financial crisis or the over-enthusiasm of its planners; the truth is that the dream of a zero-carbon city is far from becoming a reality. As the journalist Patrick Kingsley writes in his 2013 Wired article , “the city is still a work in progress that's more grand vision than realization. 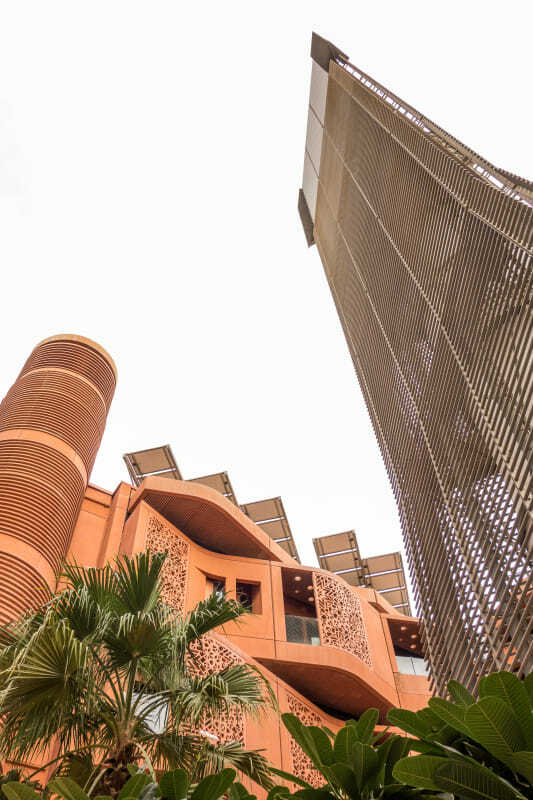 For all the Masdar team's talk of a cohesive community, it is still for the most part at the conceptual stage.” What is standing, however, is a joy to visit and to look at. The curving terracotta facades, the small squares, and narrow alleys, the famous wind tower. It is a must-see for any architect, if not to attest that it is indeed deserted, at least to see a pioneering project that is still in progress and making history. I came in by taxi, so I just asked the driver to drop me off at the Siemens Building. It seems to be an entrance point to the compound. I was there for about 2 hours, walking around all streets and getting into some buildings by myself (mostly to the lobbies or stairwells). There are several cafes and some restaurants, so it seems to be a good place for a quick lunch or breakfast. I did not find any visitor center for more information and forgot to check the electric autonomous vehicles in the basement. From Masdar, I took another taxi to Yas Island, to visit the building that put the American office Asymptote on the map: the Yas Viceroy Hotel, located within the Yas Marina F1 Race Circuit. 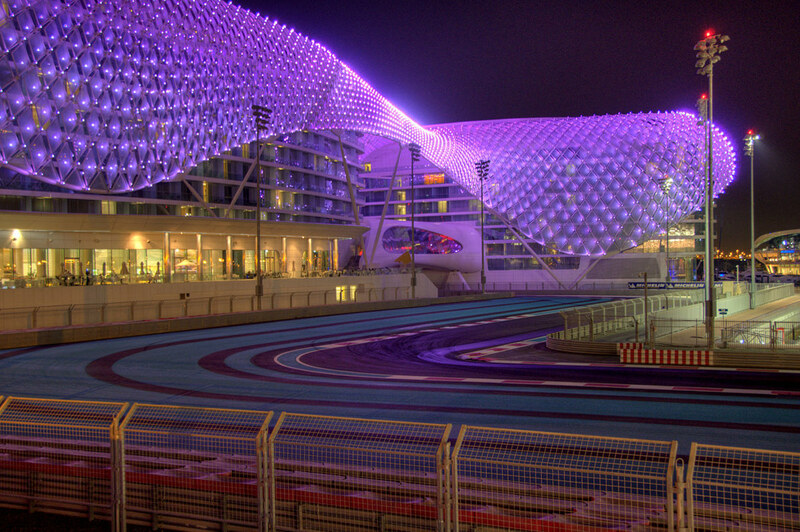 The hotel is composed of two buildings, one set within the circuit and the other within the marina. A bridge connects both buildings and crosses the race track below. The most striking feature of the compound is the Grid Shell structure roof, a flowy steel and glass structure that covers all buildings, illuminated by thousands of LED lights operated independently. The hotel has several areas open to the public. You can take the elevator in the lobby of the circuit tower all the way to the 9th floor to enjoy a view of the roof terrace and the swimming pool. Going back to the second floor, you can cross the bridge to the marina building, where another elevator can take you to another swimming pool on the 7th and 8th floors. This small tour offers you a glimpse of the interiors and a close-up of the Grid Shell structure, which is quite impressive. It also allows glances to the racing track below. I went on a cloudy morning, and the dirt accumulated on the white steel structure was obviously not that attractive. I believe the whole building livens up at night when the Grid Shell is illuminated. Or during the F1 season in November, obviously. 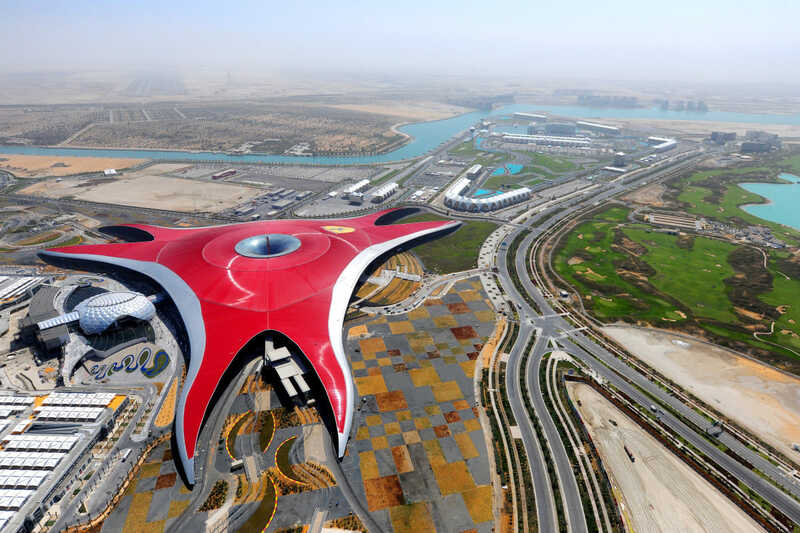 Next door to Yas Viceroy (5-minute taxi ride), still on Yas Island, is the Ferrari World Abu Dhabi , designed by the multinational firm Benoy . After seeing this weird building on the architecture blogs all over the internet some years ago, I was curious enough to go check it out. And it is indeed a monstrosity. It still baffles me that a company with such amazing, beautifully designed cars, would let such poor architecture represent itself. It is a massive canopy, with an even more massive space frame structure holding it up (it holds the record of the largest space frame structure ever built). A weirdly-shaped warehouse, it has “fingers” that extend to three sides with no apparent function, as well as an enormous, half lit funnel-like structure in the center. I was baffled, and I just don’t understand it. Unless you love Ferrari and roller-coaster rides, never mind wasting your time visiting it. 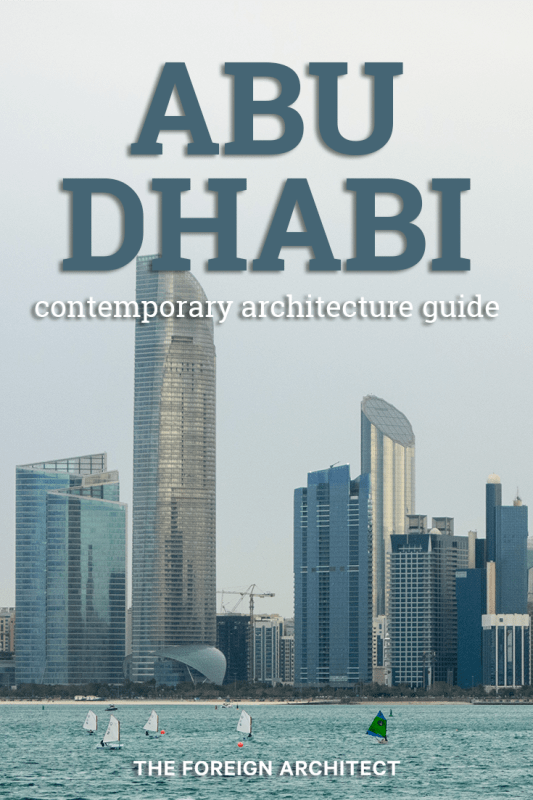 This is a must-see to any architect visiting Abu Dhabi. 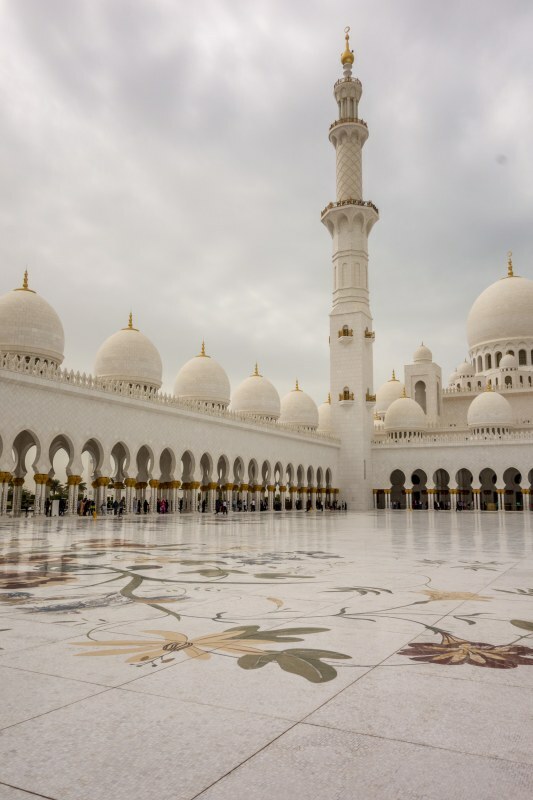 Completed in 2007, it is the largest mosque in the UAE, with its 82 domes and four minarets forming an impressive ensemble. Most beautiful for me was the delicate and colorful stonework in the columns, in the large patio mosaics, and on the entrance walls. The chandeliers inside the praying hall are also impressive, spanning 10 meters in diameter and 15 meters in height. Check the website for opening times and dressing code. Women can borrow appropriate covers at the entrance. You can walk around most of the building. I stayed for around 45 minutes enjoying the sights. It is also one of the main Big Bus stops, where you can switch lines. It was there that I finally started using it. Another project I saw from a moving vehicle: I was on top of the Big Bus, on the way to my next stop, when I stumbled upon it. 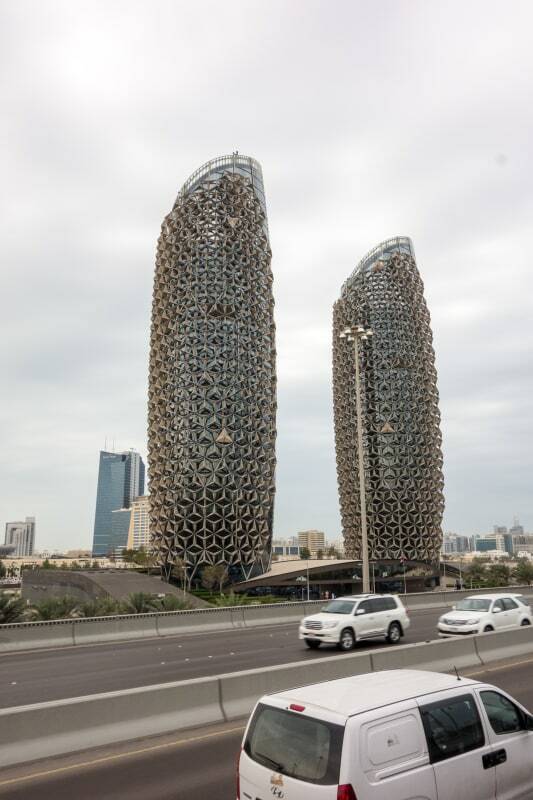 These towers became famous for their responsive facade system, inspired by the traditional Islamic shading device “mashrabiyya.” It is composed by thousand of umbrella-like modules which are supposed to close and open automatically according to solar and light conditions (when I passed by, on a cloudy afternoon, all panels were open). The twin 120-meter high towers are well proportioned, nicely built, and are also on my list of places to visit on my next trip. For one, I would love to see how the facade reacts and moves during the day. Does it work well, or is it another great idea that does not last long (see Institute du Monde Arab, in Paris)? Another island full of attractive buildings which I did not visit because of lack of time. 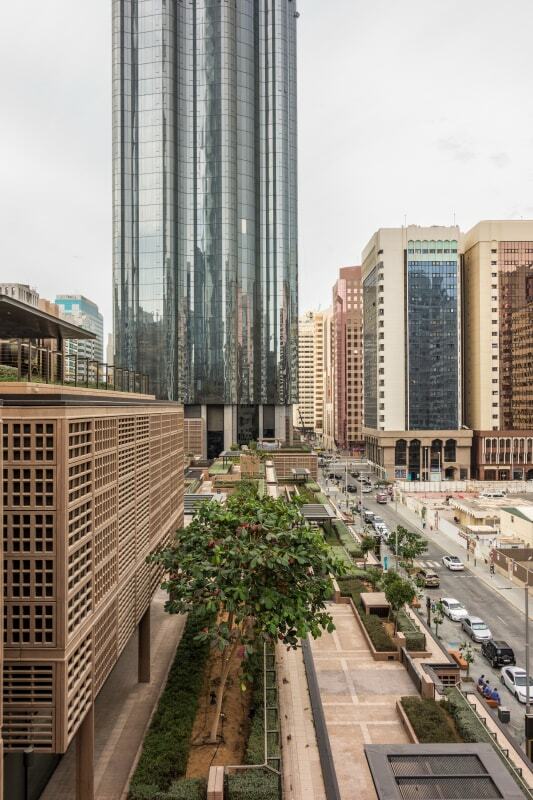 The new Al Hilal Bank Tower, by Goettsch Partners , is a blocky tower which impressed me by its subtle colors (beautiful glass!). The group of towers in Sowwah Square, also by Goettsch Partners , was also extremely impressive. 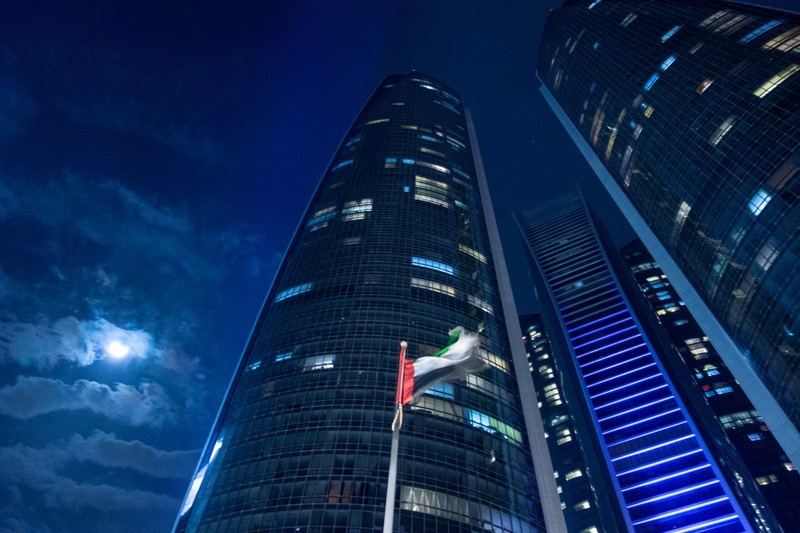 It is composed of fours towers surrounding the new headquarters of the Abu Dhabi Securities Exchange. 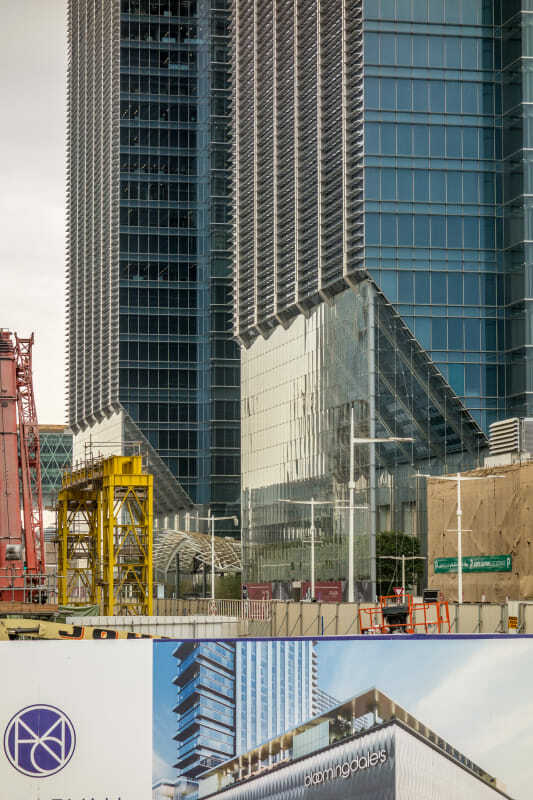 Each tower has its first office floor cantilevering at 34m height, creating incredible transparent glass lobbies on both sides of their tapering structures. Will also definitely be on my next trip list. I saw this from far away and was quite intrigued by it. It is a group of tall towers which formed quite a skyline. The island was completely out of my route though so I couldn't go. Upon further research, I learned it is one of the newest residential and commercial centers in the city. It is home to Paris-Sorbonne University Abu Dhabi. 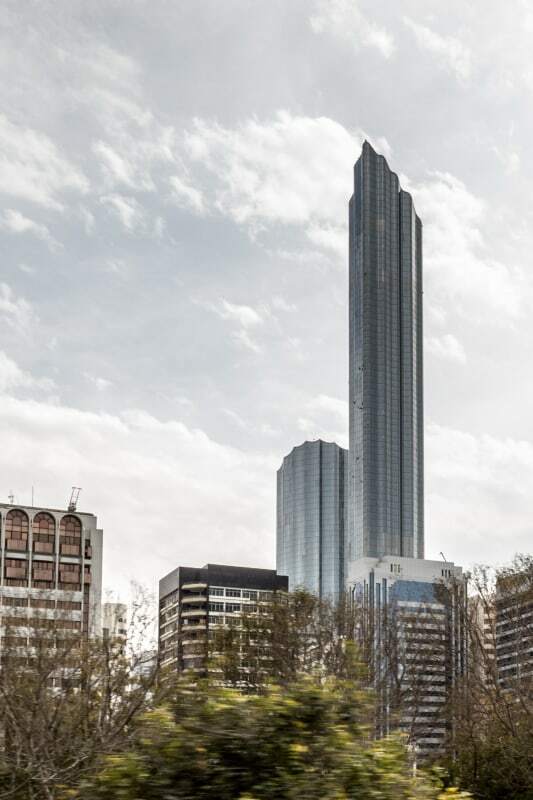 Among its most notable towers, you can find The Gate Tower , by Arquitectonica, a trio connected by a big sky bridge, which was the first to have caught my attention. Another one for my to-do list in my next visit. Called the Cultural District of Abu Dhabi, this island became famous as the home of several high-profile cultural projects: the Guggenheim Abu Dhabi , by Frank Gehry; the Zayed National Museum , by Foster+Partners; the Abu Dhabi Performing Arts Center , by Zaha Hadid Architects; the Maritime Museum , by Tadao Ando, and the Louvre Abu Dhabi , by Jean Nouvel. Of these, only the latter was built and inaugurated in November, 2017. The Big Bus had a stop at the visitor center, and I decided to take a look. The flyer promised a whole exhibition about the island and its future development, and I was hoping to see scale models and plans of all those iconic designs. Complete disappointment: at the time of my visit, all galleries were closed, and there was simply nothing to see. So check in advance if you plan on stopping by. 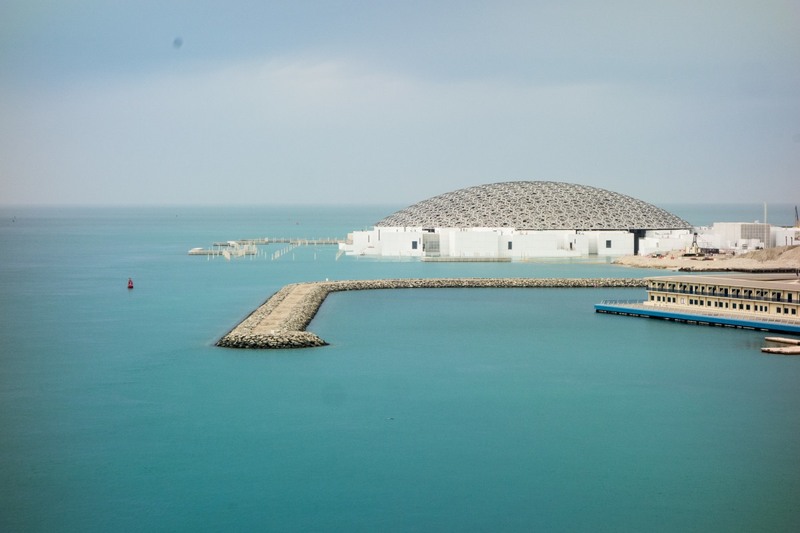 The Louvre Abu Dhabi, however, recently inaugurated. Go check it out! From the bridge approaching Al Reem Island the view of the low dome from Jean Nouvel's Louvre is surreal. Like a spaceship just landed on top of bright white boxes, half on land, half over the turquoise sea. Unfortunately that is all I could see when I visited in early 2017. The museum inaugurated later that year, in November, to great fanfare. I would expect no less for it is such a fantastic building. The huge roof, its main attraction, create an environment where light and shadow are the main elements. Check out the time-lapse of its construction below. Also, the pictures published in virtually every single architecture publication are stunning. 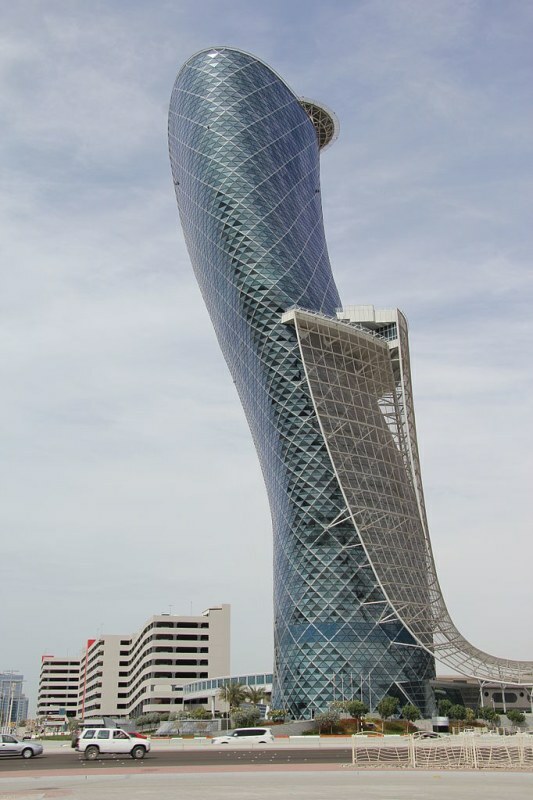 I can't wait to go check it out next time in Abu Dhabi. 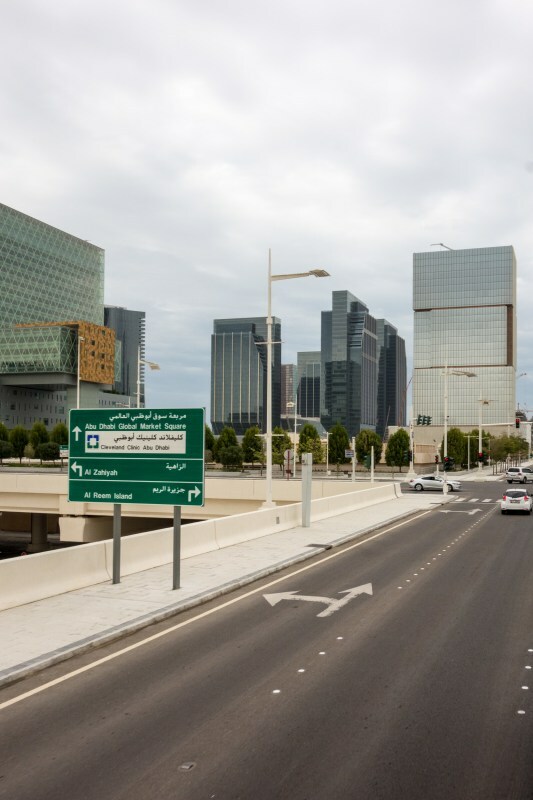 Fantastic project and by far my favorite in Abu Dhabi (so far, waiting for the Louvre!). I am not a fan of malls, but this one excels in its design and attention to detail. The atriums, the elevators, the corridors, the patterns, the windows. All fits together so well and is beautifully crafted. The rooftop gardens are also fantastic, and an endless labyrinth of terraces and stairways that offer incredible staying spaces and views to the city the towers that loom above the mall. These are also impressive. 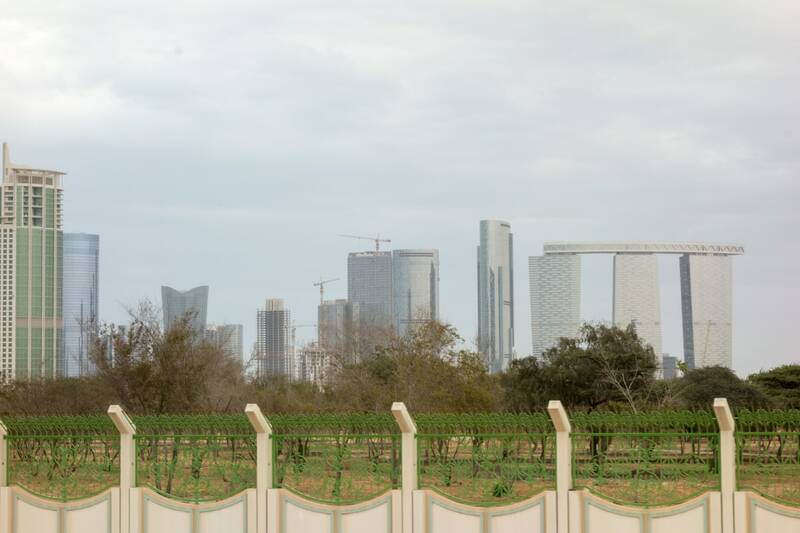 The tallest is a residential tower, the tallest building in Abu Dhabi, standing at 381m tall. From afar, it is as if the wind was creating ripples on its facade; from close up, however, the effect is less impressive because if the flat operable panels used. The MEP placement also looks messy and sloppy. The smallest tower, housing offices, is less striking with its spiky layout, and somehow does not talk to its taller sister that well. As much as I love towers, it is the shopping plinth that makes this project so unique. The fact that you can walk up to the last floor directly from the street on the outside of the building is something so hard to be able to design well in such a large project, and it was done brilliantly here. However, I was sad to see, most of its beautiful terraced gardens being unused and starting to fall apart. I believe at night, and at the high season, it would come to life, as some restaurants do spill off to some terraces. Well, it is a shopping mall, so it is easy to visit and walk around. The terraces are also totally open, and you can access them directly from the street. The towers are closed, though, with only the lobby open to the public. It is one of the main stops of the Big Bus, and easily accessible also by taxis. 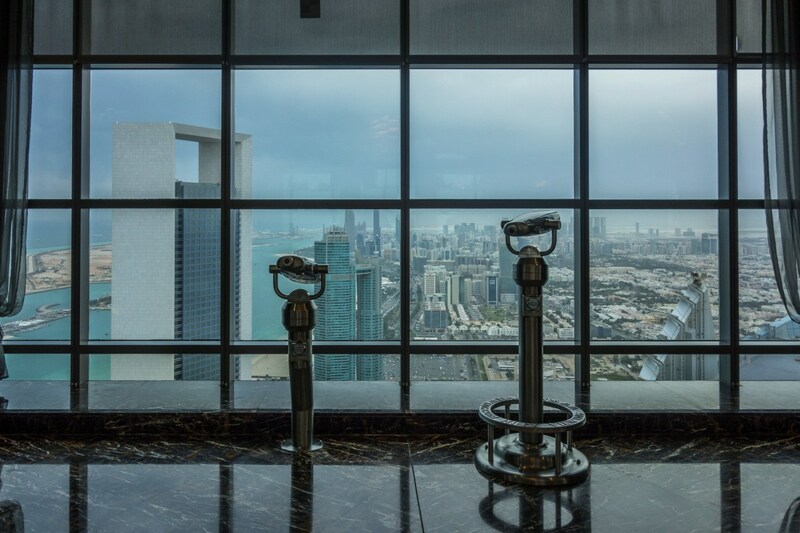 I finished the day visiting the observation deck of the Etihad Towers, a complex of 5 towers located on the west end of the Corniche. I actually started the visit there, as it was the location of my hotel (see more below), and it all fit perfectly, as I had to return to it at the end of the day to pick up my bag to go to the airport. And in the process, I caught a glimpse of the sunset in Abu Dhabi from above. The tower complex is striking from afar, but visiting it is not that exciting. It is all jumbled up together, and the towers are not particularly attractive. The Observation Deck 300 is more of a bar level on the tallest tower, and it does offer compelling views, although it would be great if it were an outdoor observation deck. The towers are connected by a shopping plinth, which publicly accessible. There are several interesting restaurants which might be worth a visit. The Observation Deck 300 is located in the hotel tower, directly from the lobby or through an outdoor entrance. Admission is free for hotel guests, and around 75UAD for others. The Big Bus Tour has a stop there. Staying one night and one day in Abu Dhabi did not seem enough, but I tried to make the best of it. After a 15-hour flight from Sao Paulo, my principal concern was to have a good night’s sleep before the next leg of my journey to Beijing, so I picked a hotel that offered a good balance between price and comfort: Jumeirah at Etihad Towers . It is a fine hotel located in one of the five Etihad Towers (see above). The view from my room was not especially exciting. 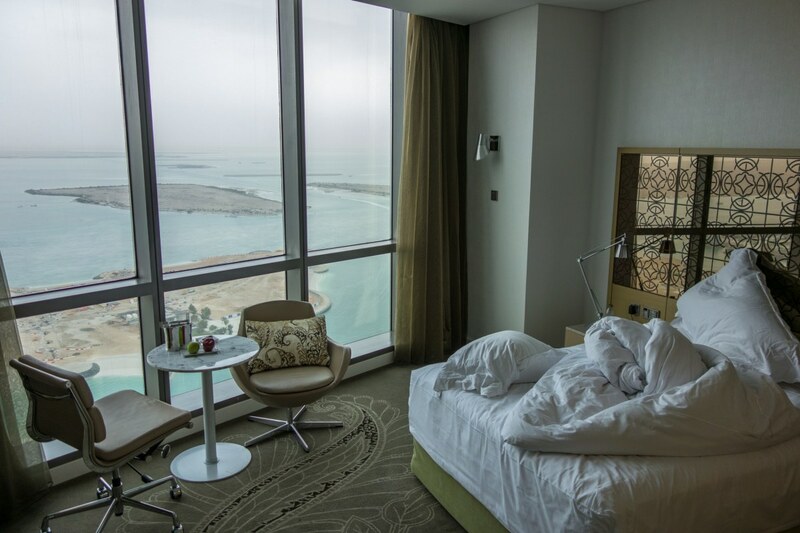 I would recommend asking for a room on the city side, from which you could see the Corniche and the city center skyline. I arrived quite late and had dinner in a well-recommended Lebanese restaurant located in the podium of the Etihad Towers called Li Beirut . It was delicious as expected, much more food than I could handle, and a price to match. If you are not alone, it is a great deal. Just order one of the sets, and you'll be very satisfied. On my tour day, I made a quick stop to eat at a Shish Shawerma, recommended by some guide on the internet. It was indeed good and very cheap, but only worth it if you are close by.